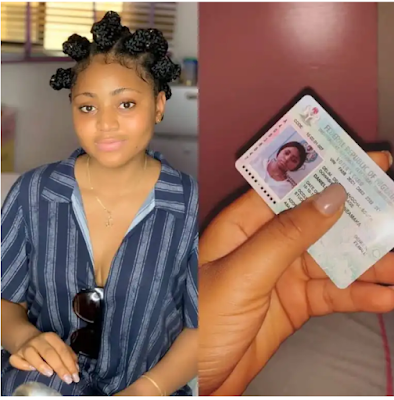 Nollywood Teenage Actress, Regina Daniels who is currently elected as the Youth Campaign Coordinator For Nollywood With Humility and youthful zeal for Atiku took to her Instagram page to show off her Permanent Voters Card. But their is something strange about year on the PVC, Regina stylishly uses her hand to block her date of birth but the ’19..’ is obvious if you observe well. The actress is not 18 years according to wikipedia , the teenage actress would be 21 by October, 10. This is coming after Regina Daniels, accepted her appointment by the presidential candidate of the Peoples Democratic Party (PDP), Atiku Abubakar, as a youth campaign coordinator for Nollywood. In her own word: “I’m Regina Daniels. Proud to be 100% Atikulated with Atiku Abubakar who is in the race to become Nigeria’s next President. I accept my appointment as Youth Campaign Coordinator For Nollywood with humility and youthful zeal. Atiku is a youth-friendly leader who has assured that every 4 out of 10 of his cabinet will be a youth. The drift is brazen. The nation is at crossroads. The land bleeds from hunger and inertia. It’s time to steer the ship away from caput. From Bama to Bori, Aba to Abuja, kaura Namode to Kaduna, the sky is gloomy. After she announced her appointed, Nigerian actor Uche Maduagwu advised Regina Daniels on his social media, He wrote: “@rita.daniels06 Why didn’t they give @regina.daniels SCHOLARSHIP abroad? Why campaign coordinator? Are their own children not studying abroad? Wicked politicians, so why didn’t they give @regina.daniels scholarship abroad too? So while their own children are busy reading outside the country during election, they want someone else’s daughter to be doing Nollywood youth campaign coordinator for their party?Omg, she is just 18 years old, why can’t she concentrate more on her education? @rita.daniels06 All these politicians in Nigeria are SELFISH, why can’t they give @regina.daniels a scholarship to study in the best Universities in America or UK? Is Regina not the same age as their own children? Is she not too young for all this?. Recently, Nigerians took to Instagram to blast Nollywood actress, Regina Daniels for always claiming year-in-year-out that she’s 16. Recall that in 2017, she celebrated her 16th birthday, however many people accosted her after she made a post which insinuated that she’s still 16. Sharing the photo, she wrote: Oh yes ! Am pretty and i know it….. if u are older than me and u call me ugly, bring out your picture when you were 16″.